I'd like to check this one out. Kudos for taking on such a arduous task...2500 movies is a lot. Do you have a timeframe to accomplish this feat? Sammy: Thanks for the comment, and for stopping by. WINGED MIGRATION is definitely worth checking it; it's remarkably beautiful, and while you wouldn't think a documentary about migrating birds would be interesting, you'll find, as I did, that your eyes will be glued to it. As for the 2500 movies, my only plan at this point is to post one new movie every day until I reach that number. Of course, at that pace, I'll be at this for somewhere around seven years! We'll see what the future holds (whether I up the number to 2-3 a day or not), but for the here and now, it's one a day. Have you see Home(2009) ? 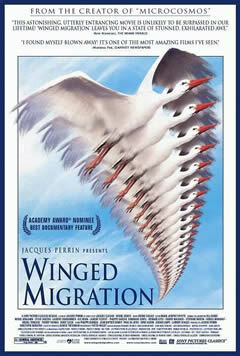 I recently reviewed it on my blog, probably my favourite enviromental film. I recently saw "Earth", which is also staggeringly beautiful. I think the narration and music is important in these kind of films, any thoughts on that? @moviesandsongs365: Thanks for stopping by, and for the comment. I have not yet seen HOME, but would like to. I also haven't seen EARTH, but I have seen the BBC's PLANET EARTH, which I think contained a lot of the same footage Disney used for their film. PLANET EARTH was amazing, BTW. I definitely agree that music is important. However, just to let you know, WINGED MIGRATION doesn't rely heavily on narration; it falls back almost completely on it's impressive visuals. That said, when used properly (like in PLANET EARTH), narration can certainly be an integral part of these kind of documentaries. Thanks again (and nice blog...I've added it to my blog list on the right-hand menu). Hi, I can't figure out how to add your site in my RSS feed reader. Can you tell me what I'm doing wrong, please. Hello, and my apologies! For some reason, your comment was delivered to the SPAM folder! You can subscribe via a link on the right-hand menu (under SUBSCRIBE NOW). Again, my apologies, and thanks for stopping by.